Want to go on a Match-Three Safari full of deformed animals that are caged in some weird contraption called a “crazy ring?” Well, if that specific craving has arisen, Crazy Rings is for you. 101 stages full of fun and oddly not-very-funny humor. For some reason the game is listed in the store as “the funniest game ever” or something, but I have yet to even see a real joke or something funny. Maybe that’s the joke. 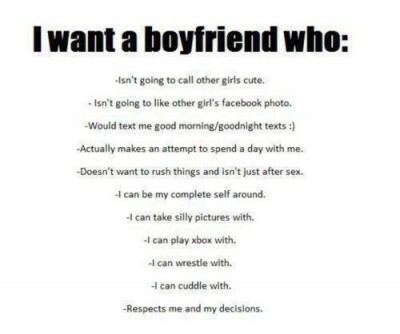 I guess it doesn’t matter. What there IS to like is probably what should be paid attention to, anyway. Through the “Campaign” mode, in which you presumably play through all 101 of the stages, you are trying to get as many points as possible and clear the Crazy Rings with as much efficiency and/or combo-making as possible. Once you complete a level, you gain up to three stars (you can earn zero, too) depending on how well you do in the level and progress to the next one. 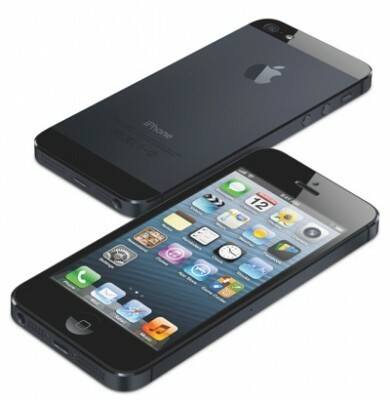 The concept is not hard to grasp, nor is it really that difficult, at least until the point I’m at, which is Stage 25. The game can get a bit hectic, depending on the little things they throw in to make it harder/easier to play. There isn’t a whole lot of variety up until this point, but I’m not complaining since the art is nice to look at, and the game isn’t really that frustrating to play – it is also a stable application that doesn’t crash or have frequent bugs that I have encountered. The essential control mechanic is to tap where you want to send one of your spherical animals, and in doing so, try to match them up with the others and try to make combos, like many other Match-Three games. What makes this game a little bit unique is that the crazy rings will rotate, expand, or travel around in a circle, so you will have to pay attention to those elements in order to not misplace any of your spherical lions, frogs, snakes, pigs, or other animals. You can also have multiple crazy rings which will also rely on the speed of each ring’s rotation if you want to match any animals with the outer rings, as they can all be rotating and expanding at the same time. At a certain point, the game will begin to give you helpful one-time-use power-ups. One of them is a pork-chop-shaped meat thing that you can launch at the ring of animals, and they will all go chasing after it off-screen. This can be useful if you have two rings at the same time or if you just have a lot of random animals. Another power-up is a tranquilizer needle, which can slow down the ring that you shoot at, limiting its rotational speed or elastic rate. Later on, there is a Rhino that you can use to break through any obstacles, including rocks. I’m sure that they throw in different power-ups and obstacles every now-and-then to break up the monotony. Obstacles, like the rocks, which act as a wall within a crazy ring can change your strategy in completing a level. You aren’t able to save these particular power-ups, and you have to use them within about 10 seconds of their appearance, or lose the opportunity to use them. The only power-ups that you actually keep are Rocket Rings. Rocket Rings are basically things you can use to “cheat” and clear a level if you somehow get frustrated enough to use it. I am not entirely sure if Rocket Rings are acquirable in-game, but you are able to buy them. Doing so will also unlock all of the levels in the game without having to progress one-by-one — it is a package deal and I’m not sure if you are able to just keep buying Rocket Rings after your first purchase. Considering the Rocket Rings aren’t very enticing to use, and you can unlock all of the levels by yourself anyway, I don’t know why you would WANT to buy this “package,” even if it is a very low price to do so (at the moment, $0.99). The game isn’t particularly annoying in trying to get you to buy anything or share anything with your friends, so that is a welcomed aspect. There are also no naggy notifications or stupid social/faux-multiplayer bloat features. What I enjoy about the game is that you are actually playing a game and not trying to show your friends how cool it is to not play a game. The game itself is quite meaty, considering there are 101 levels, and once you get through all of those, you can re-play them and try to get three-stars or play what seems like an endless-play mode called “Zen Mode.” The rings probably get crazier and crazier (and difficult) as it goes along. The sound effects/ambient noises aren’t annoying, so they’re nice to play with if you require something to listen to, but you’re not missing much if your phone is on silent. The game is not a bad bargain for “free.” If you like puzzle games, you will enjoy Crazy Rings, and while it may not be the most unique concept you’ve ever seen, it is still worth playing. It can get pretty hectic at times, but I have yet to encounter a level that I couldn’t pass on the first go. I’m sure that in the later levels it may become difficult enough where it may require a couple of tries, but in general, there isn’t much retrying. 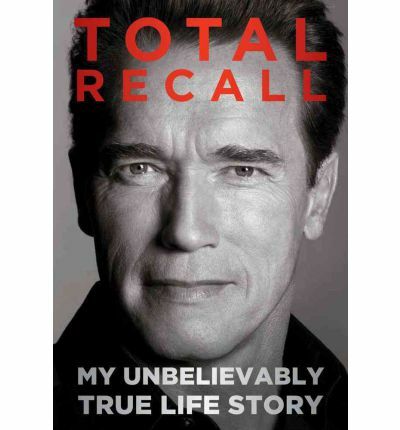 Q: Did you hear about the guy who got trampled at the zoo? 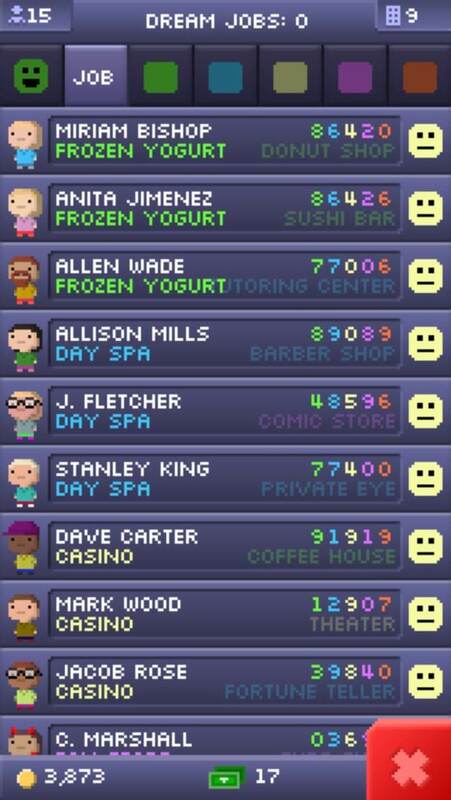 Tiny Tower is one of those games that takes a relatively simple concept and artificially inflates the time it takes to do anything to make you feel like spending money to get ahead. But that’s every game nowadays on an iOS or Android platform, and its easy to get riled up about business aspects of any of these “free to play, pay to win” games. 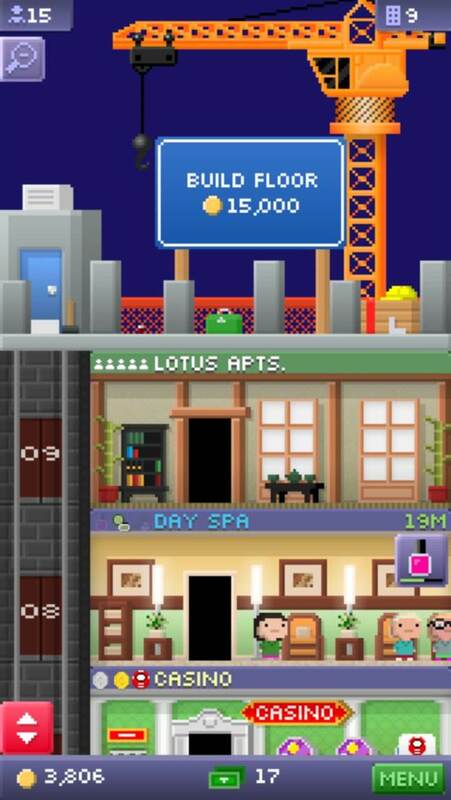 So, what does Tiny Tower offer that you might not occasionally see in other games? Well, I can’t say that there’s much that I really “enjoy” about the game except for maybe two things: the art style and the humor. It’s nice to say that in this case, Tiny Tower actually tries to go “against” the curb, looking cartoony or “old” (read: 8-bit) and get away with it. Truth be told, the art style mixed with the humor therein is more what makes this game enjoyable than anything else. 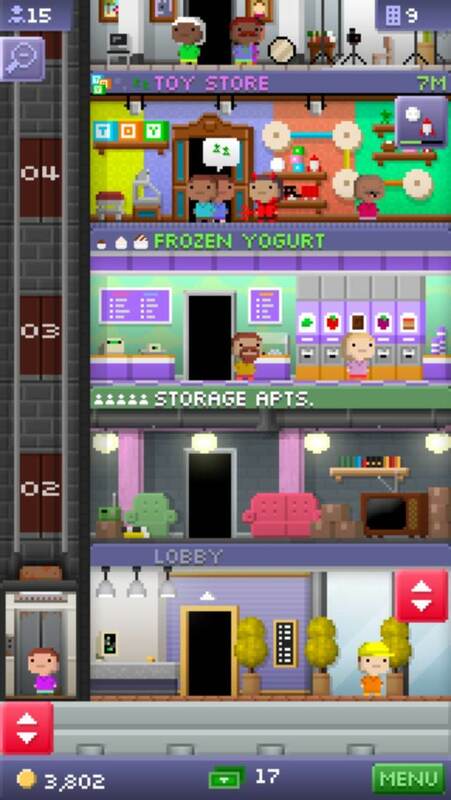 In Tiny Tower, the basic goal of the game is to add more floors to your tower. Your tower floors can be residential or a random store within six individual categories. The people who live in your tower work in your tower. These little slave people bend to your will and will work and live wherever you tell them to. And if you don’t like their face or their skills, you can evict them. 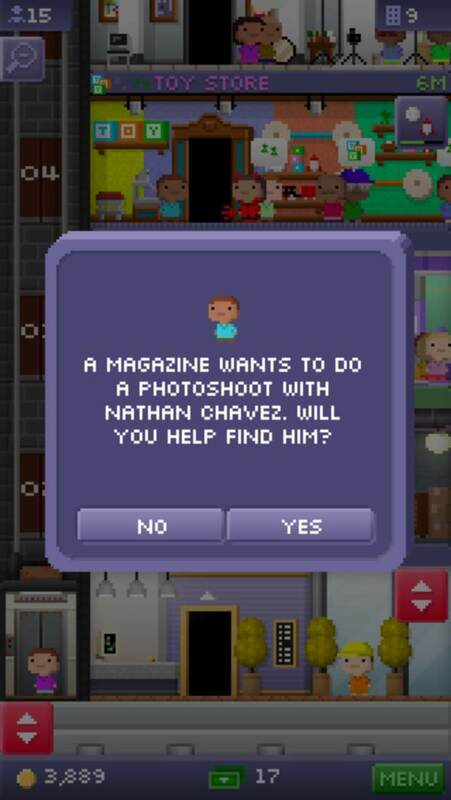 Ah, yes, Tiny Tower is also probably making a social commentary on the downturn of the economy with people having “dream jobs” of working in a donut shop or a coffee house, but I digress — that is probably part of the humor of the game and also adds an element of difficulty in trying to match your “Bitizens” (whom live in your tower) to work and be happy. Oh, and they also pay you rent. It’s indentured servitude at its finest, and they can wear a sheet to look like a ghost while doing it all. 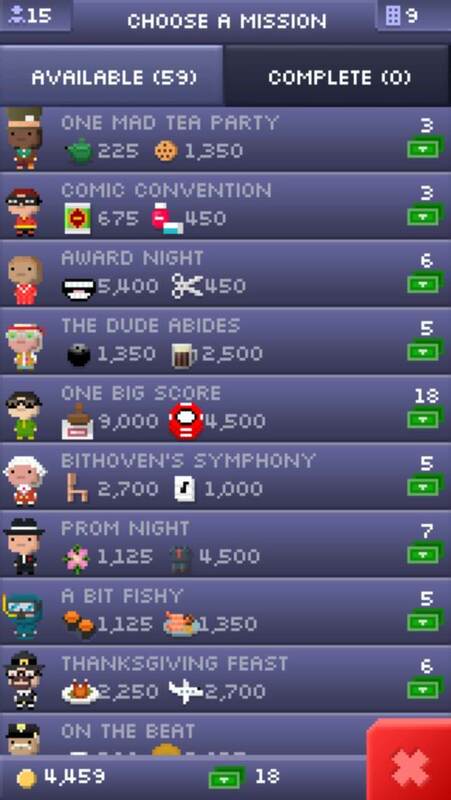 Tiny Tower is an okay game. It isn’t exactly the most fun that I’ve ever had with my spangly-dangly iPhone, and I can’t imagine I’d be playing this game for very long because of it. I think what actually ticks me off about the game more than anything is that there is a lot of micromanaging involved. Each business on your floor has 3 items it can sell, and each take a certain amount of time to “re-stock.” Once re-stocked, the game notifies you the item is ready to be stocked, and doesn’t start selling until you go back into the game to click it and then get back out. I thought I was paying my little slaves to do that for me, why do I have to get notifications every 3 seconds to do something new? I thought this game was supposed to be leisurely fun, not harassing me to pay attention to it like a GigaPet or Tomagatchi! Not only do I have to do that, but I have to monitor all of the floors individually by clicking on them and figuring out which items will become out of stock soon. There isn’t an easy way to just view all of the possible re-stocking actions I can do and decide from there — I have to individually click 6 different floors to see what’s up and if I don’t, I run the risk of losing potential money. What happens when I get to 30 or 40 floors? Who do they think they’re kidding with this? Reeling it back a little bit, there is basically one goal to the game, and that is to add more floors for you to manage. To accomplish this, the game gives you two currencies. You know that when there are “two currencies” in a game, one is the one you actually want (Coins), and the other is the one that they want you to buy with real money (Towerbux) so that you can save “time” and actually progress in the game to the point of madness before you have your third coronary. 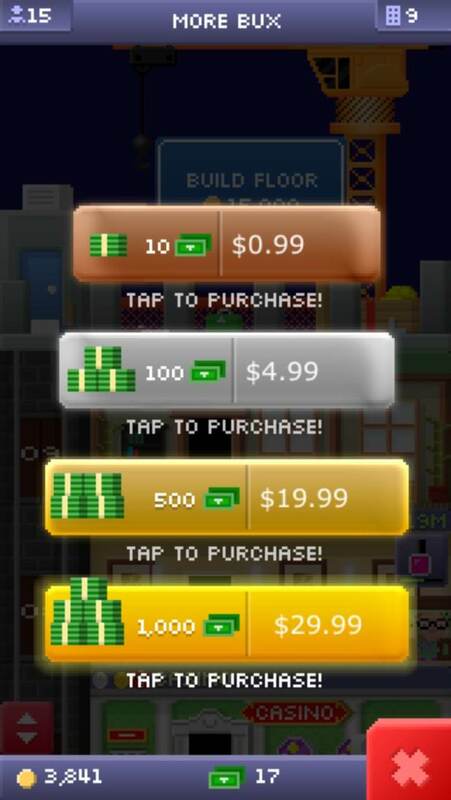 Towerbux can be used to buy more coins, or pay off some of your Bitizens to do stuff faster. Great, so why couldn’t I do that with coins? OH, that’s because Towerbux cost like 3 to 9 cents each (depending on the bulk size) and THEN you can convert them into coins, but you can’t seem to do it the other way around. 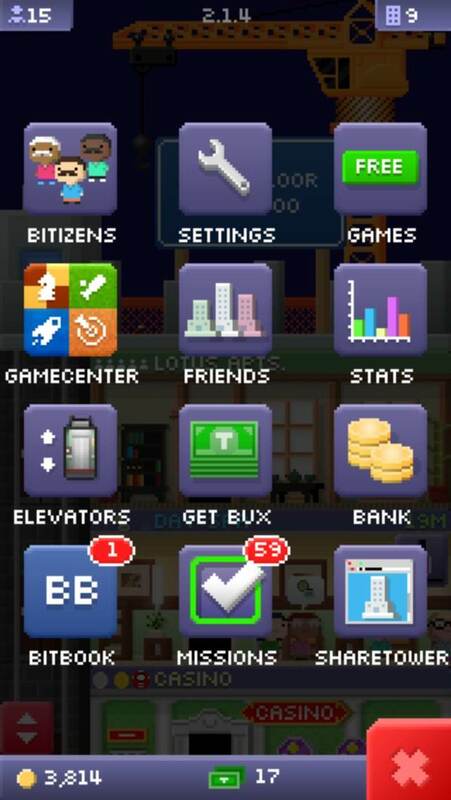 Tiny Tower allows for a little leniency in this regard, however, since there are actually ways to earn Towerbux INSIDE the game and as a result the game is balanced around using Towerbux to at least a certain extent. It makes Towerbux not seem as useless as its cousins in other games, like BlowJobBux, or whatever they’re called in other games, since you actually get to use them. If a game were giving out free Blow Jobs, would you not partake? Coins are the real end-game, however, and the more coins you get the more floors you can add to get more coins for the whole process. Towerbux essentially help you earn more coins at a faster rate, and depending on if your math skills are any good, you have to figure out what the best way to use your Towerbux actually will be. My general tactic seems to be using it for the “3rd tier” items for whatever has the most stock that can sell (since they sell for 3 coins each, as opposed to the lower tiers which are 1 and 2 respectively). The amount of stock that an item can maintain depends on who works there, which also relies on your ability to count from 0 to 9 and being able to assign people to the right color based on those numbers. Sometimes Bitizens will be useless in your situation, so you can evict them and hope for a better idiot to replace the guy who is wearing last year’s purple hat. Or hope that you’ll get an Asian-looking lady for your Day Spa so that you can start selling Happy Endings. There isn’t ALWAYS something to do in the game, though. 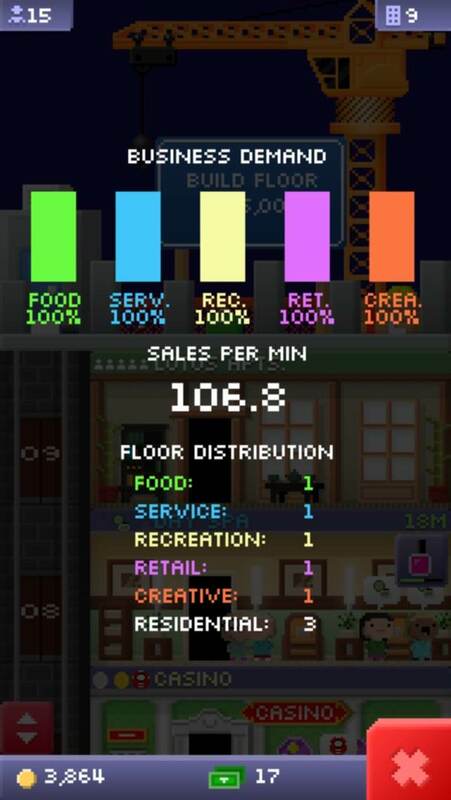 So, during those times where you’re just trying to wait for more measly minutes of your life to pass you by while you wait for another event to happen in Tiny Tower, you can act like an elevator attendant and work for tips. Depending on what floor they ask you to take them to, you’ll get twice the amount of coins there. However, you will occasionally get one Towerbux instead and boy howdy, it’s time to go to the strip bar! If you know what I mean… it’s on the 69th floor and the 3rd tier of stock to sell is Backroom Dances, so you can tell them to “Hurry!” and get some more Backroom Dances in stock so that people can start buying them at 3 coins each so you can repeat the whole process again and be depressed that there is absolutely nothing better to do with your time than be a slave to this game. Not only do you have to wait anywhere from 10 minutes to 3 (or more?) hours for things to restock, but you have to use coins to pay for the restocking so that you can earn more coins. It sort of doesn’t make sense to me when you look at it from a gameplay standpoint, even if it makes sense in a real life standpoint. But this game is not real life, it is a game. They should just make us earn less coins per stock or reduce the amount of stock you gain per restock. It is sort of a weird, needless, cyclical thing going on and perhaps it is some sort of fail safe on their end so that if you end up spending all your coins and somehow can’t afford to restock anything you have to sit there and waste an hour elevating people to parts of the tower that are closed because they can’t sell them anything — or buy Towerbux so that you can exchange them for Coins!! AHA! I found out their little scheme. But, for now, I’m just going to chalk that up to another one of those “meaningless” micromanaging things they thought was necessary to include in this game, since there’s a lot of those already. Once you further progress in the game, you are also able to fulfill missions and get Towerbux for them. There are about 50 of them, and it probably isn’t even worth doing for the return you get. So, what makes me come back to this game? Honestly, not much. The only idle interest I have in pursuing the game any further is to see how ridiculous the micromanagement of all of your stores can get once you add a lot of floors to your tower. I’ve played the game for approximately two days and I already find it taxing on my sanity. Every three minutes I feel like I have to go back to the game and do “something” before I put it down and wait another three minutes to do “something” again. The game is stable and has some seemingly useless social aspects in which you can see what towers your friends have or whatever, but that interests me not in the slightest. How about spending more time on a single-player experience and less with these meaningless faux-multiplayer features? This game certainly didn’t help my terrible cough, that’s for sure. Since I wrote the review, I ended up getting to the point at which I had 40 floors in my Tower. The more floors you added, it seemed like the game began to become less stable and you would get random crashes now and then. They also updated the game for “Valentine’s Day” a week before February even rolled around, and made everything an obnoxious pink. I finally decided enough was enough and I uninstalled the game on February 3rd. I feel like a weight was lifted off my shoulders, and I probably should have done it much earlier. This is an absolutely terrible game, and I would probably re-rate it at about 3.0/10 based on playing it for a long time (3 weeks straight?). 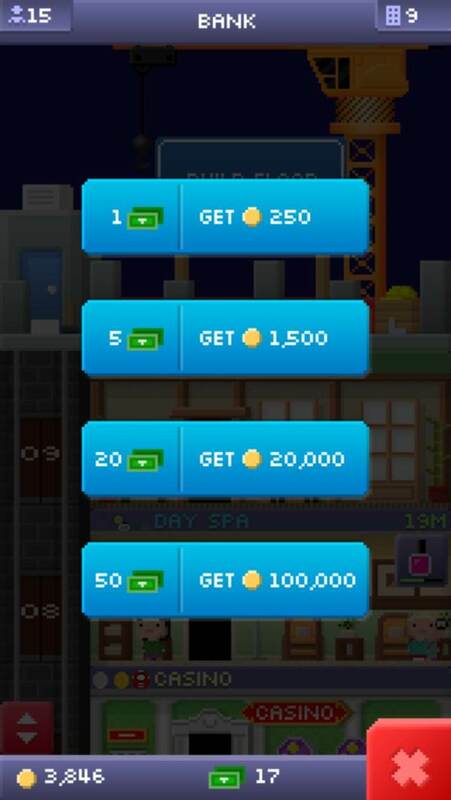 I can only imagine what floor that poor schmucks out there who actually enjoy this game are at, and how much time per day they spend restocking and shuffling Bitizens. A girl spent about 10 minutes trying to fix a paper jam for the paperwork she was printing out for me after davepoobond gets his car serviced. She opens the back of the printer, and for about 30 seconds she is digging in it without being able to look in, and finally she pulls out a piece of paper. Obviously she didn’t get it as a joke because her emotional response was not indicative of understanding it as one. And then the printer paper jammed again as more sheets were printing. Slots are one of your basic casino stereotypes. Old ladies clutching their purses, chasing the 20 dollars they get from their nickel bet… It’s not that exciting to think about. In fact, it’s probably a bit comical. Video slots are much different, though, and appeal to a new generation that is very technologically and entertainment-focused. Video slots open up a whole new realm of possibilities such as bonus games, screwing the gambler through incorrect math programming, and enchanting the player with even more lights and sounds than mechanical slots typically offered. Themes also work a lot better with video slots. 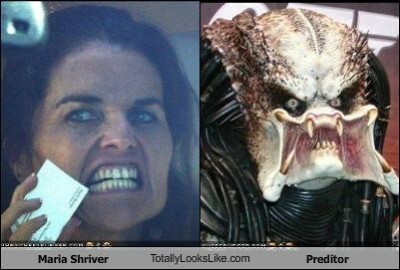 Star Trek slots, anyone? 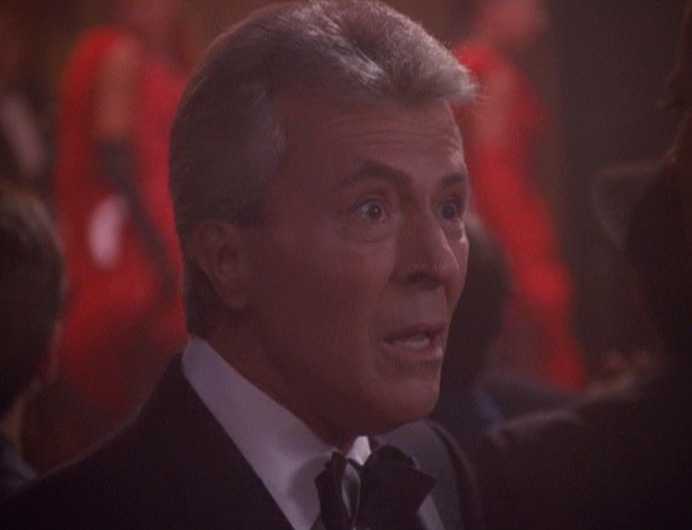 Who wouldn’t want Shatner’s soothing frequencies spurted every time you lost a spin? Slots – Pharaoh’s Way is basically going to be the best video slots fix you’re going to get for free or otherwise. I personally downloaded this on iOS 6 with an iPhone 5 and have become enamored with the fake gambling experience it provides. If the title of the game wasn’t obvious enough, it is an Ancient Egypt-themed slots game. The game contains all of the things that make actual video slots fun and exciting to play. Fast plays, smooth animation, high quality art that fits in with the theme, and lots of annoying noises. The first thing I did was turn off the audio, of course. It should be obvious that if you don’t like the concept of video slots, this game is probably not for you. I would say that slots in general do not appeal to me, at least until I played video slots a couple of years ago. Video slots, to me, provide more “gameplay” opportunities when it comes to bonus games – and boy are they (usually) exciting. Slots – Pharaoh’s Way replicates the exciting feeling of normal video slots by providing unique bonus games (depending on the slot game you are playing) and free spins. If you break down the goal of the game to its very basic element, you are doing one thing: Earning Diamonds. These Diamonds are used in grinding levels to unlock more slots to play. Diamonds are earned through normal slot play and each progressive level has a substantial percentage more to get to the next level, which promotes playing more/upping your bet to get further along. Playing straight through, the feeling you are grinding out levels doesn’t settle in until about level 13 or so, and depending on how many Credits (the game’s currency) you have, it is fairly influencing to up your bet and earn Diamonds at a faster, even reckless, pace. Your most reliable source of Diamonds comes from your initial bet at a rate of x2 what your bet is. If you’re betting 10 Credits per slot play, you gain 20 Diamonds, if you bet 100, you get 200, etc. More often than not, at least one of the spaces on your slot board will be bonus Diamonds which also increase at a rate of x20 what you are betting. In this case, you gain 1000 bonus Diamonds for a 50 Credit bet, and so on. That’s only if you hit bonus Diamonds in a space, and that can sometimes prevent you from winning more Credits depending on its placement. When your next level is about 150,000 diamonds away (at level 21) you’re almost going to be hoping for the bonus Diamonds more than anything else you could get. Essentially, when you are using Credits to win more Credits, what you are actually doing is using Credits to get more Diamonds, and being as efficient as possible in earning Diamonds becomes the real intent. Earning Credits only allows you to have a chance of earning more Diamonds. There are also various rewards and bet amounts unlocked for each progressive level, which can supplement your Credit gain/usage. What I began to realize is that earning Credits is paltry compared to getting Diamonds, and in the end Credits almost mean nothing as the game forces you to keep parity with your growing Credit pool and level by upping your bet to earn more Diamonds at a higher rate. No matter how many Credits you have, you will practically always have the “same” amount of spins you started out with as the winnings all scale linearly. The only thing that increases exponentially is the barrier to level up. Sure, you could play for 1 credit each bet while you have 3,000 sitting in your pool, but what the hell is the point when there’s absolutely NOTHING else to do with said Credits other than to earn Diamonds with them? In a sense, it combats the inflation that the developers no doubt predicted would happen with Credits, and unless you want to be stuck at the level 20 range for the rest of your life and never unlock another slot, you’re going to be upping your bet. My personal strategy for betting with Credits has been to always have “100” spins available to me before I go bankrupt. If I fall below the 1,000 Credit mark, I would lower my bet to 10 Credits so that I could work my way back up to a comfortable level for my currently-comfortable bet of 50 Credits. However, when I get up to 5,000 Credits I’m sure I’ll at least up it to 100 or 250 Credits. Design-wise, all of this makes sense. When you actually play it, however, you begin to beg for variety. Playing the slots game proper is good enough, and every time you win a bet, you get the option to play a simple card game where you can guess the color or suit of the card and gain twice or four times what you won in the slot game. This bonus game is fun for a while, but ends up being less enticing as the stakes get higher, since it really is not in your favor, and doesn’t even net you any Diamonds directly. You’ll probably not want to waste time playing it at all after a while, regardless of the fact that the card game has better odds than the actual slots game at the end of the day. New slots open every 10 levels with new artwork, a different bonus game, different payouts, and slightly different rules/spaces. For example, the second slot is only 3 reels, but every consecutive 3-way match is counted. On the 5 reel slots, which are the first and third slots, you have 25 to 50 lines in many different random combinations that are harder to predict when you win. The idea is that the more progressed slot has the best payouts, but you might visit the previous ones to get a change of scenery every now and then. Each slot has its own bonus game which throws in a little variety every now and then, but they are barely rewarding. One of the bonus games named River of Luck relies on your… “luck” to guess whether or not the next number in a sequence of numbers will be higher or lower. If you know anything about statistics, it might be an easy decision process, but it certainly does take a long time to get through the game, not to mention the payouts are almost laughable for the amount of time you spend on it until you guess about 8 times in a row correctly (which almost never happens). The bonus games don’t typically hit often either, which adds to the disappointment. The monotony of constantly pressing the “spin” button can be subsided with the AutoPlay option, but then it REALLY feels like you’re doing nothing, so I use it sparingly — only when I’m jerking it. Other bonus games are pretty simple, like “finding a match” and clicking cat idols until you click two of the wrong ones. Meh. I think there is a missed opportunity here with the way the game is made as far as bonuses go. If they made some mechanic for spending a certain amount of Credits and being able to play a bonus game that awarded Credits, Diamonds, or even both outside of the random chance of the Slot games, it would be a lot more fun to play for long sessions. Even if they were rehashed bonus games that you already unlocked for the slots you are playing, it would be a step in the right direction. As it is, you simply plug away and hope that you get to the next level range before the turn (pun!) of the century. But I suppose that’s where buying Credits might alleviate this frustrating aspect of the grind. Every 4 hours you are able to collect free bonus Credits. When the four hours are up your phone will light up and notify you that you are able to collect bonus Credits, thus allowing for the timer to restart. Your bonus will increase the more levels you gain, but in the end you’ll probably burn through it all in about a couple of spins regardless of how much you actually get, since your normal bet will keep increasing along with the bonus. If you are really enthralled with the experience, you can always buy more Credits. The option to buy Credits isn’t terrible, but you come to think about the philosophy behind a game like this. By no means is Slots – Pharaoh’s Way a major offender of the “Free2Play” format as you can get by just fine without ever paying one red cent to get ahead. At some point, though, you’ll need to up your bets considerably to match the teetering-on-the-insane Diamond grind. Taking a long, hard look at business practices for one throwaway game might be a waste of energy, but this isn’t the only game with this model. “Free2Play” games create unique products that may not have otherwise been available, and I know that I wouldn’t be playing this game at all if I had to pay anything to play it. With so many options for games nowadays, getting someone to even spend time with your game is particularly valuable when you can make more money than you ever could per player by creating the capability to spend absurd amounts on it on the back end. At the end of the day, Slots – Pharaoh’s Way is what it is, regardless of the philosophy involved. Having a four page review on what is “simply” a slots game is probably overdoing it but as soon as I started playing I knew I had a lot to say about it. The game sets out to do what it does with almost perfect execution, and the only glaring flaw is that the game lacks variety and more of a meta-game. I don’t only want to progress, but I want to be able to play a random cool game every hundred spins so I can be excited to do another hundred spins to play that quick, fun mini-game without taking too much focus off the slots game itself. It would be a detriment to the point of the game to have a whole suite of mini-games that are always accessible – but there is a happy medium that should be attained. Otherwise, all you’re “doing” is grinding the Diamond counter, and not playing a game. It is “drop-in-a-bucket” gameplay at an extreme. From what I gather, this game is actually updated every couple of weeks to add more slots and adjust payout balance or math errors. I’m not sure how engaging this is for people who just start out the game, since it appears you have to grind at least 50 levels before you even get to a “new world” which may or may not be available at this point. To know the game is supported is nice, however. But it would do wonders for the game if it had some sort of “news” in the game to keep people up to date with what’s going on.